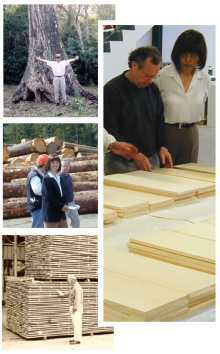 At North American Wood Products, we build programs which match a world of diversely manufactured wood products with discriminating buyers. NAWP program selling means the customer receives products of consistent quality from specific mills. Suppliers get customers who are committed to them and their products. If you are looking for a specific species, growing region, grade, color or weight, or if you need a specialized custom size or cut, we will find a reliable source that will meet your particular requirements. It is our goal to be the best matchmaker in the world! Niche markets can be very demanding and global markets complicated. But unique opportunities exist to bring atypical wood products to new markets, with a greater return. With our global knowledge base and visionary focus on "value-added" resource management, NAWP can help you to expand your options. Our sales and support team is creative and versatile, with associates who can also tend business in Chinese, Japanese, Korean, German and Spanish. Contact us to talk about sourcing a product or selling your products.